I wish Rachael Ray was vegan. I love that she makes big plates and easy meals that are done in a half hour or less, like me!!! She recently made her version of this pasta on her show, and before she dumped a cup of parmigiano-reggiano on it, it was almost plant-based perfection. I remade it, with miso to add depth and touch of saltiness, and now it is vegan, healthy, and delicious. I could have eaten the whole thing myself. Slice the shallots thinly. Mince the garlic. Add olive oil to a pan (with sides) and add the shallots and garlic. Keep the heat on medium low and caramelize the shallots until they are super soft and starting to brown. Take the kale off the stems and chop. Add 1 tablespoon of miso to the shallots plus 1/2 cup of the pasta cooking water. Whisk together until miso is dissolved. With a few minutes to go on the pasta, add the kale to blanch it, which is a great way to take the edge off. 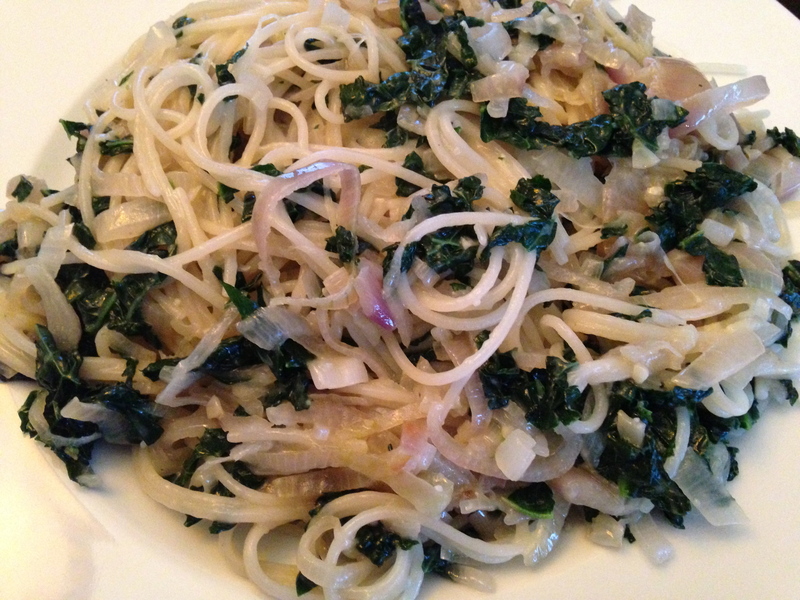 Drain the pasta and kale and add to the pan with the shallots. Mix well and turn out onto a big dish.